David Hoffeld is the CEO and chief sales trainer of Hoffeld Group and is the author of the groundbreaking book, The Science of Selling. He created a revolutionary sales approach based on neuroscience and behavioral science that radically increases sales. Because of the results David’s insights generate, he’s lectured at Harvard Business School and has been featured in Fast Company, Fortune, U.S. News and World Report, The Wall Street Journal, INC, Forbes, Harvard Business Review, CBS Radio, Fox News Radio and more. David’s expertise in both selling and behavioral science equips him to understand what it takes to successfully sell in today’s hyper-competitive marketplace. Because of David’s sought after perspective, he has attracted clients ranging from small businesses to Fortune 500 companies. 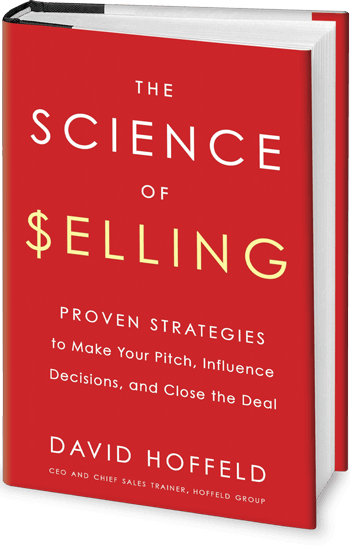 Hire David to teach your sales people the science of selling.